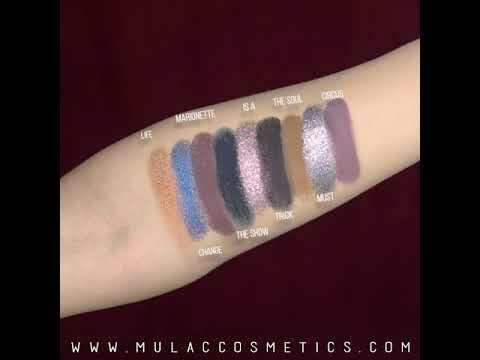 9 eyeshadows with pearlescent, matte, and glittery textures. INGREDIENTS: MICA, ZEA MAYS (CORN) STARCH (ZEA MAYS STARCH), SILICA, DIMETHICONE, CAPRYLYL GLYCOL, OCTYLDODECANOL, SYNTHETIC BEESWAX, METHICONE. MAY CONTAIN (+/-): ULTRAMARINES (CI 77007), IRON OXIDES (CI 77499), BLUE 1 LAKE (CI 42090), FERRIC FERROCYANIDE (CI 77510). INGREDIENTS: MICA, SYNTHETIC FLUORPHLOGOPITE, CETEARYL ETHYLHEXANOATE, CAPRYLYL GLYCOL. MAY CONTAIN (+/-): TITANIUM DIOXIDE (CI 77891), IRON OXIDES (CI 77499). INGREDIENTS: MICA, OCTYLDODECYL STEAROYL STEARATE, CETEARYL ETHYLHEXANOATE, ZINC STEARATE, CAPRYLYL GLYCOL, ACACIA DECURRENS/JOJOBA/SUNFLOWER SEED WAX POLYGLYCERYL-3 ESTERS (ACACIA DECURRENS/JOJOBA/SUNFLOWER SEED CERA/POLYGLYCERYL-3 ESTERS), TIN OXIDE. MAY CONTAIN (+/-): TITANIUM DIOXIDE (CI 77891), IRON OXIDES (CI 77491), IRON OXIDES (CI 77499), FERRIC FERROCYANIDE (CI 77510). INGREDIENTS: MICA, ZEA MAYS (CORN) STARCH (ZEA MAYS STARCH), SILICA, DIMETHICONE, ETHYLHEXYL PALMITATE, ZINC STEARATE, CAPRYLYL GLYCOL, DIMETHICONE/VINYL DIMETHICONE CROSSPOLYMER, SIMMONDSIA CHINENSIS (JOJOBA) SEED OIL (SIMMONDSIA CHINENSIS SEED OIL). MAY CONTAIN (+/-): TITANIUM DIOXIDE (CI 77891), IRON OXIDES (CI 77491), IRON OXIDES (CI 77492), IRON OXIDES (CI 77499), MANGANESE VIOLET (CI 77742), RED 40 LAKE (CI 16305), BLUE 1 LAKE (CI 42090). INGREDIENTS: POLYETHYLENE TEREPHTHALATE, GLYCERIN, MICA, POLYURETHANE-11, CAPRYLYL GLYCOL, POLYURETHANE-33, JOJOBA ESTERS, HELIANTHUS ANNUUS (SUNFLOWER) SEED WAX (HELIANTHUS ANNUUS SEED WAX), SIMMONDSIA CHINENSIS (JOJOBA) SEED OIL (SIMMONDSIA CHINENSIS SEED OIL), POLYGLYCERIN-3, ACACIA DECURRENS FLOWER WAX. MAY CONTAIN (+/-): RED 40 LAKE (CI 16035), BLUE 1 LAKE (CI 42090), ALUMINUM POWDER (CI 77000), BLACK 2 [NANO] (CI 77266), FERRIC FERROCYANIDE (CI 77510).